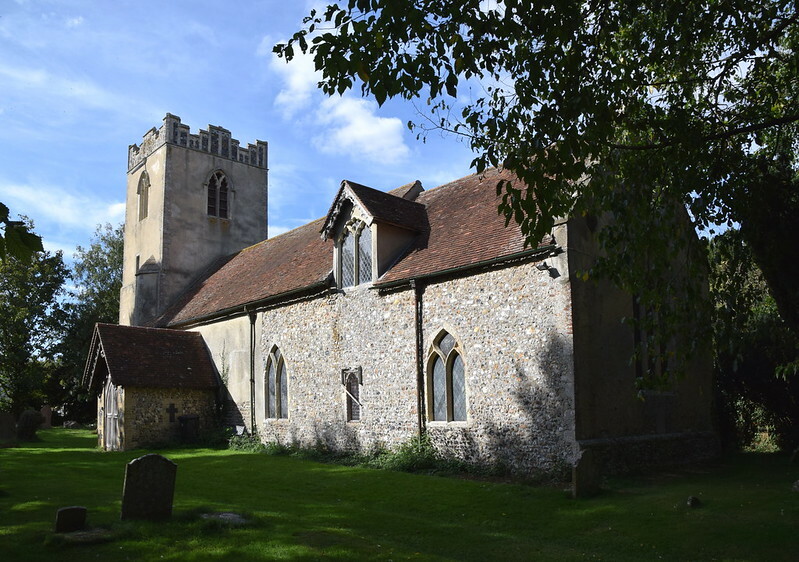 St Nicholas was one of the first churches I visited for the Suffolk Churches site in 2001. I arrived in a downpour not knowing what to expect, and was a bit miffed to find the porch locked. 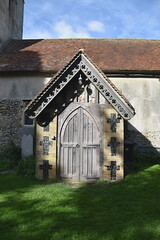 In fact, the church was one of about twenty declared redundant as part of the Diocese of St Edmundsbury and Ipswich's lunatic act of corporate downsizing in the 1970s. 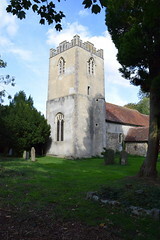 This is despite its distance from any other CofE parish church. Indeed, Wattisham itself is a remote place, apart from the adjacent airbase. Fortunately, the Diocese no longer does this, and equally fortunately, St Nicholas did not fall into the hands of property speculators. 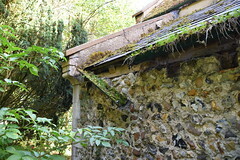 It was, uniquely in Suffolk at that time, taken over by a charitable trust, who used it for concerts and exhibitions, ploughing profits back into caring for the building. Although this situation was clearly not ideal, it was better than that of any of the churches that are now private houses - they are lost to us for ever. I saw no particular reason to come back here, but it so happened in the early autumn of 2018 I was cycling back to Stowmarket station and happened to pass through Wattisham. I kept my eyes open for the church, but before I knew it I was out the other end of the village and returned for another sweep. Across the entrance to the churchyard that I'd pushed my bike through seventeen years previously there was now a security fence, which made my heart sink. 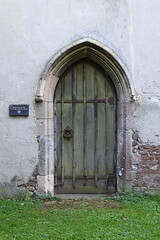 It suggested that the church was no longer in use, and had been abandoned. 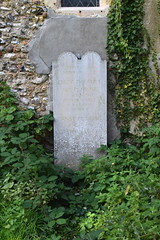 However, thirty yards or so to the west I found a redirected public footpath which led me into the churchyard. 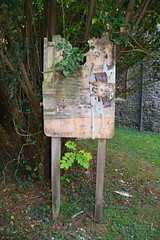 To my pleasant surprise, this was clearly still well-maintained, had recently been cut and was obviously regularly cut. The church itself, still locked of course, seemed not to have benefited from such care and attention, the gutters sagging and gaping, one window held in place by a brace of wood. 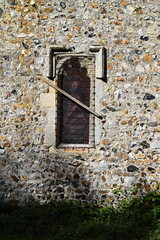 Peering through a north side window, the church was surreally furnished with tables and chairs as if it were a roadside café, but suggesting that the building is still at least in occasional use, despite the rotting notice board telling a different story. St Nicholas church is essentially a work of the 14th and 15th centuries, with much detail surviving, but the heavy hand of a Victorian restoration rather overwhelming it. 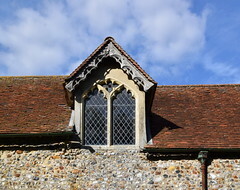 Pevsner thought that the dormer windows above the east end of the nave, unusual in Suffolk, were from the 1840s restoration, perhaps based on the 15th Century ones at St Nicholas in the centre of Ipswich. In the 1930s, Cautley found little to interest him except an armorial shield. He abhorred the repainted roodscreen, with its melodramatic Victorian Saints, now reset in the south aisle chapel at Bildeston, along with a number of other fixtures and fittings. The reredos is now at Little Finborough. 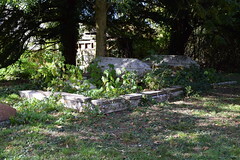 In the 1950s, Dickinson's revision of the Dutt guide found an 18th century memorial to six people of the same family who all lost their feet because of gangrene, which would have been fun to see, seventeen years ago or today. Why was this church not needed? 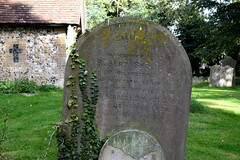 I suspect that, as at Rishangles, a thriving Baptist church in the village had something to do with it. So I cut my losses, and, like last time, I went and had a look at that instead.